A surprisingly elegant building in which different architectures and styles co-exist, frescoes and pictorial decorations of great value, a delightful outdoor area and a central position in the most visited part of the old city of Genoa. This is Palazzo della Meridiana, a 16th century historic residence, which was reopened to the public in the fall of 2010. 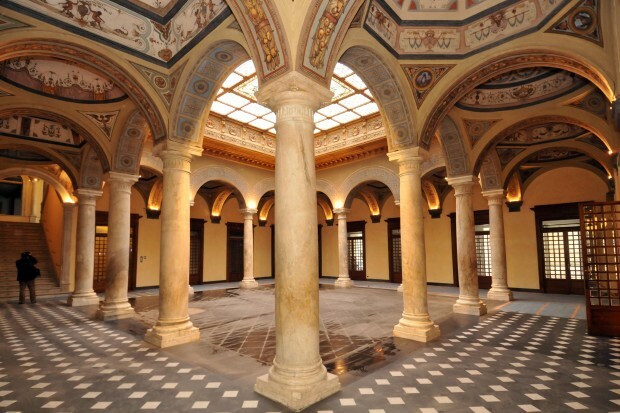 The building is one of the earliest and most significant pieces in evidence of the architectural restoration of Genoa. The sundial drawn on the façade gave the name to both the building and the square below it, exactly on the corner of the magnificent Via Garibaldi, originally called “Strada Nuova”, or New Street. offices, shops and apartments of great prestige. Due to the collapse of the “Ponte Morandi” viaduct of the A10 motorway, between Genova Ovest and Genova Aeroporto, departing passengers are advised to move to the airport far in advance. For more information, we advise you to consult the page of mobility that is constantly updated.